It’s no secret that U.S. oil production has trended skyward over the past decade; in fact we are now the number one producer of oil (and natural gas) in the world, thanks to hydraulic fracturing. But last year, the United State hit a major mile. 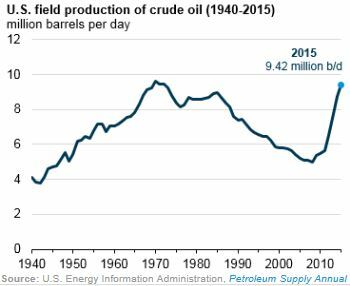 According to a report released this week by the U.S. Energy Information Administration, U.S crude oil production in 2015 reached its highest level since 1972. Averaging about 9.42 million barrels per day (b/d) in 2015, this boost in production was led by an enormous production increase in Texas from 2014 to 2015. This finding, that advancements in drilling technology and techniques has allowed U.S. operators to produce more with less, is supported by a report from energy consultancy Wood Mackenzie released in July. According to Wood Mackenzie, the cost of production for U.S. operators has fallen by roughly 40 percent over just the past two years thanks to improved development efficiency and cost reduction efforts throughout the process. 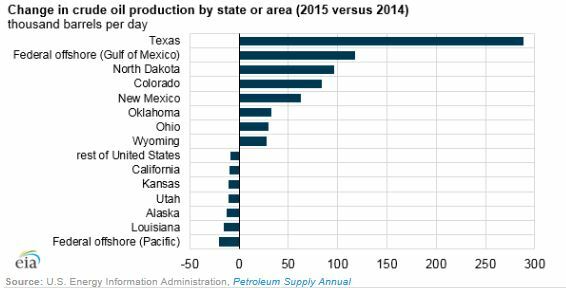 But this begs the question, with efficiency leading to greater production volumes across the board, why is it that Texas specifically has seen the greatest relative increase in production? The answer is simple: geology. Texas has long been known for its wealth of natural resources, but the Permian and Eagle Ford shales, with the help of fracking, are proving to be world-class oil and gas plays even in this difficult price environment. Current estimates of prove crude oil and condensate reserves in Texas top 14 billion barrels, with 2.1 billion barrels in new proved reserves added in 2014 stemming mostly from the Permian Basin and Eagle Ford. This development efficiency, coupled with the massive reserves found in Texas, has not only meant a significant rise in production, but also a revival of drilling activity in Texas. As a Bloomberg article from earlier this year pointed out, 24 of the 26 most profitable places to drill in the U.S. – at even a $30 per barrel price point – are found the Eagle Ford and Permian. Additionally, the Permian Basin alone is currently home to 218 active drilling rigs, up an amazing 81 rigs since May. Even at current commodity prices, this impressive production is expected to continue. The EIA is projecting that crude oil prices will average about $48 per barrel going into 2017 – a far cry from the $90+ price environment from just a few years ago. But while prices may have dropped, operators have continued to innovate and the EIA estimates that U.S. crude oil production in 2017 will be roughly on par with the 8.76 million barrels produced in 2014. While blessed with abundant natural resources, the United States is also blessed with a drive for innovation. This drive for innovation in oil and gas development has allowed U.S. producers to weather the storm of low commodity prices, helping America maintain its position as a global energy superpower.